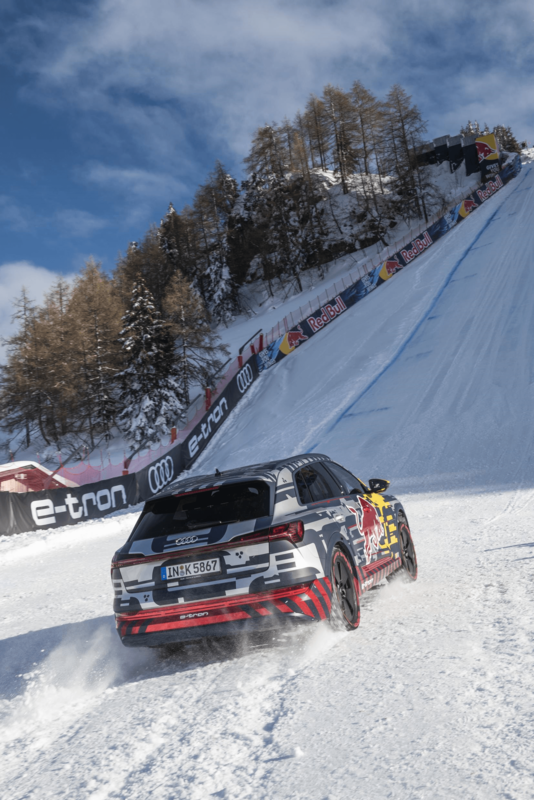 As title sponsor of the World Downhill Ski Championship, Audi would have been mad not to seize a promotional opportunity like this, states Iain Robertson, as a means to show-off its EV technology in the most gruelling of conditions; Range Rover move over! Ignore the escalatory challenge pictured here for a moment…all EV (Electric Vehicle) manufacturers have a number of well-perceived problems to overcome. One of them is battery usage under duress, with the other being performance in sub-zero temperatures. While carmakers will boast and use marketing-speak to extol the virtues of charge ranges in excess of 180-miles, the sad truth is that EVs driven in the same way as their petrol, or diesel, alternatives might be, will attain closer to a notional 130 to 140-miles of range. Introduce a frosty morning and that figure will dip uncomfortably into the 80 to 90-miles range, while living in Edinburgh, or any one of a number of hillier towns and cities, hillclimbing will play its part in depleting available power. Away from the marketing twaddle, reality continues to nip at most carmakers’ heels. While the true uptake rate of EVs remains at a low ebb for the moment, we all know that a pathway is being prepared for broader EV usage, sponsored by governments worldwide. However, to elect to ignore it is not an excuse. Audi, as part of the wider VW Group, has a certain responsibility to adhere to, not least in the wake of the ‘dieselgate’ debacle that has made the firm even more conscious of its eco status. It dares not overstate MPG figures. It has to be equally aware of wrongful claims on its EVs. 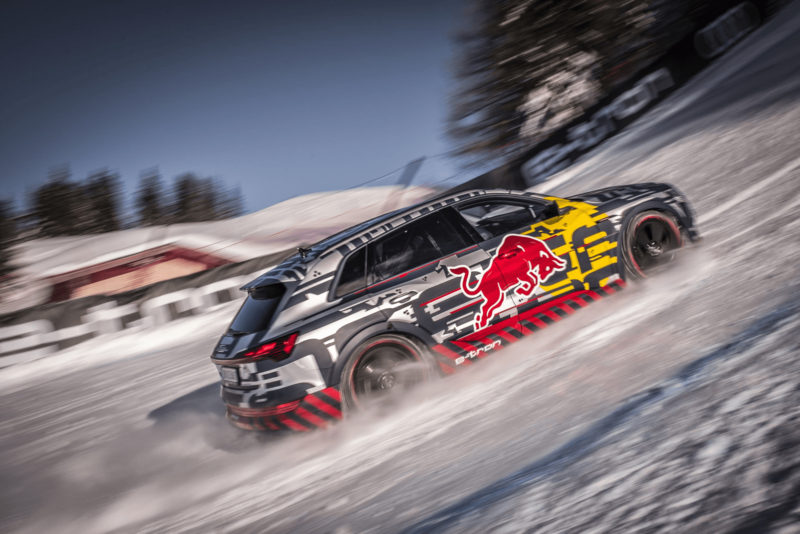 To prove a couple of points, Audi has despatched its first fully electric-powered SUV onto the hallowed Austrian slopes, where the world’s best ski racers battle for victory in the Hahnenkamm Race. The ‘specially equipped’ Audi e‑tron climbed the ‘Mausefalle’, on the legendary ‘Streif’ course. With an 85% gradient, it is the steepest section of the spectacular downhill course, where standing-up is actually and humanly impossible. With an 85% gradient, the ‘Mausefalle’ is the steepest section of the famous ‘Streif’ downhill course at Kitzbühel. To climb this route, the Audi e‑tron technology demonstrator was equipped with a special quattro powertrain with twin electric motors on the rear axle and one electric motor on the front axle. The technology demonstrator achieved a total boost output of up to 370kW and a wheel torque of a phenomenal 6,579.1lbs ft. This ensured full performance on the steep gradient in sub-zero temperatures. Audi also modified the software considerably, in respect of both drive torque and torque distribution for the special conditions on the hill. 19.0-inch diameter wheels, complete with tyre-spikes developed specifically for this driving event, provided the necessary grip on the mix of snow and ice. Naturally, this type of hardware, while related, is not going to form the standard specification of the e-tron model, when it appears for public consumption later this year. However, as a test bed, it is a fantastic achievement that must not be understated. Mattias Ekström, Audi’s contracted racing driver, who was engaged to tackle the challenge, said: “Conquering such a vertiginous gradient seems impossible at first, as it is impossible, even with very grippy boots, to stand upright on the hill. 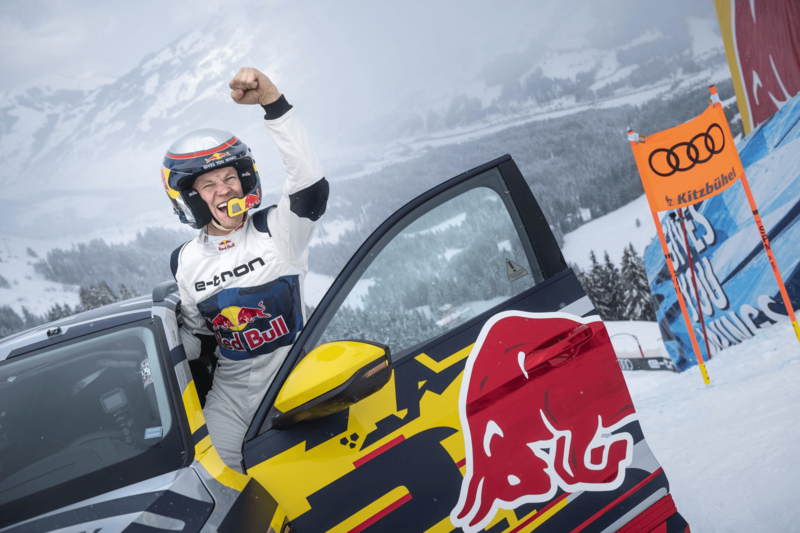 However, even I was impressed with the way this car handled such difficult terrain!” The World Rallycross champion and two-time DTM (German Touring Cars) champion considers this one-off event to be among his most extraordinary driving experiences. For the greatest possible safety, the Audi e‑tron technology demonstrator was equipped with a roll cage, external bull-bar and a racing seat with a six-point safety harness (none of which will come with the production version). The vehicle itself was equipped with a ‘belay’, through which a safety cable was run. Although there was no pulling device, health and safety demands insisted that the car be restrained, in the event of being unable to scale the slippery heights. Fortunately, the e-tron completed the task, without a need to draw on its safety margin. Audi had a strong partner at its side for this project, the Austrian beverage producer Red Bull. 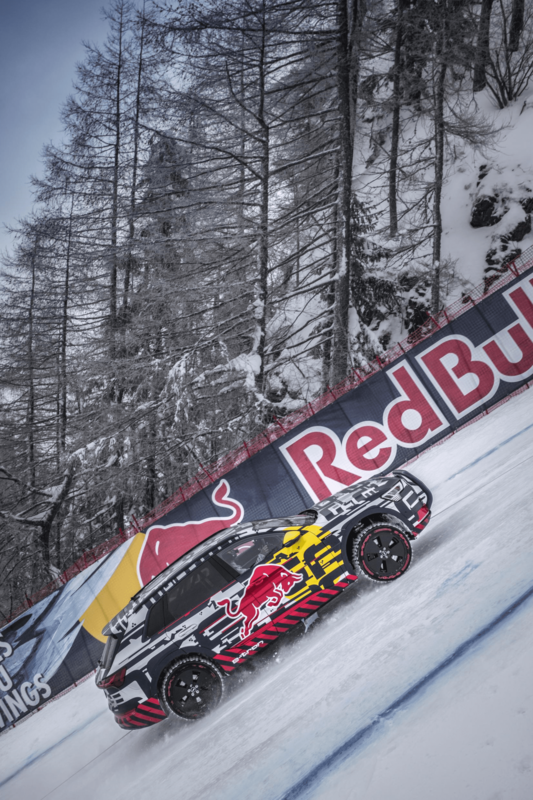 The two companies are long-standing partners of the Hahnenkamm Race and conducted this challenge together. The Audi e‑tron also illustrated the collaboration with a special set of appliques. The video clip from the event is available here. Conclusion: If you want to make an impression, scale the heights. You may recall that Range Rover performed this task last year in China, with its PHEV model (check into our motoring archive to find the story). However, Audi appears to have trumped its British-based rival with this gargantuan task. « Have a little look at these amazing miniatures!